Pine Creek Rail Trail: Darling Run to Tiadaghton, Tioga County, Pa.
A horse-drawn wagon tour comes down the Pine Creek Rail Trail at Darling Run. Did you know that Pennsylvania’s got its own Grand Canyon? I wasn’t either, truth be told, before we came out there earlier in August. But this particular Grand Canyon runs north-south down Tioga County in the north-central part of the state, the result of glaciers having run roughshod over the area back during the Ice Age. The result is the Pine Creek Gorge. Pine Creek was an important travel route in the area for a very long time; the Senecas had a well-traveled footpath along the creek banks. Starting in the nineteenth century, the Jersey Shore, Pine Creek and Buffalo Railroad (which connected to the New York and Central Railroad) ran down through this gorge along the banks of Pine Creek, as the region became home to a thriving lumber industry. The train tracks, the stations and the rail towns are (mostly) gone now, but the rail bed still exists, repurposed as the Pine Creek Rail Trail starting in the 1990s. 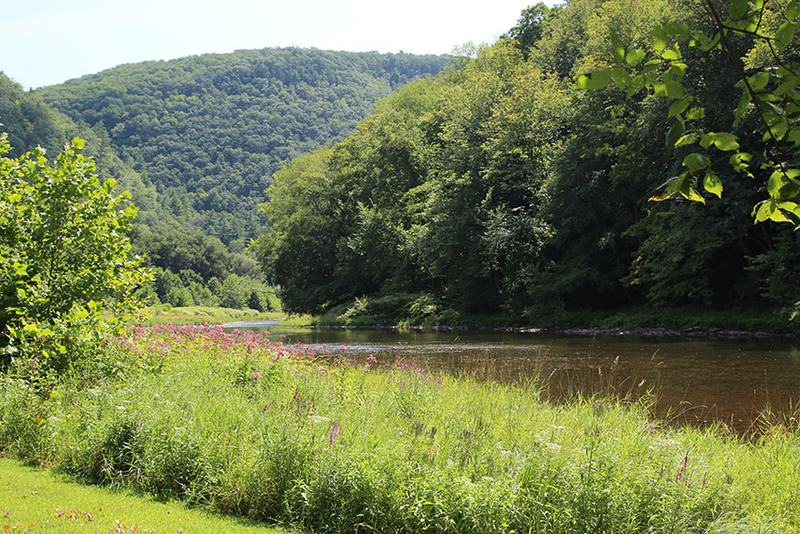 The trail and the two nearby state parks are all part of the Tioga State Forest. The entire trail is about 62 miles long (47 of them in the gorge), and starts in Ansonia and finishes in the town of Jersey Shore. Needless to say, we did not tackle the entire trail on this trip. However, we did a 15-mile round trip between Darling Run and Tiadaghton. You can find trail maps online, in some of the interpretive kiosks along the trail, or at one of the other state parks in the area. Got a little surprise as we were securing the car and bringing the bikes down to the trail. 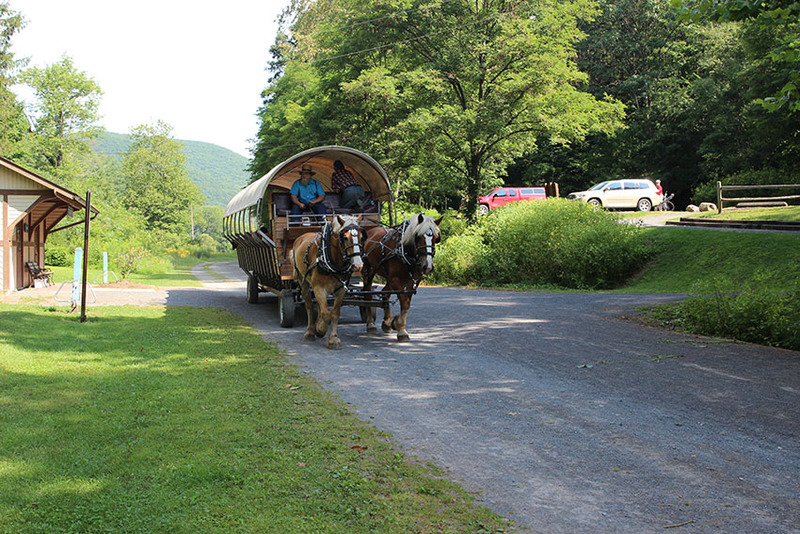 There’s apparently a tour group based out of Wellsboro that takes covered wagon tours along part of the trail – and there was a wagon, drawn by a pair of draft horses, coming down the path as we were bringing the bikes down to the path. There are a few unisex outhouses at strategic points along the trail, and at key points like Darling Run and Tiadaghton. They’re marked on the map. You’ll also find, a few miles south of Darling Run, the lower trailhead for the Turkey Path trail, which climbs up the gorge and connects with Leonard Harrison State Park up on the canyon rim. And there’s another state park, Colton Point, across the creek from the trail. After about an hour or so (wasn’t really keeping track of time, actually) of fairly vigorous biking, we pedaled into Tiadaghton and decided to take a lunch break. A view of Pine Creek and the gorge from the clearing at Tiadaghton. Founded in the 1880s, Tiadaghton was a little railroad town with a collection of houses and stores, a school and businesses up until the early twentieth century, when the post office shuttered for good. The town buildings are all gone. But at the Tiadaghton waypoint, there is a very nice clearing in the woods along the creek where picnic tables and bike racks have been set up; it’s my guess that the picnic area is part of where the town used to be. And it’s a lovely scenic area, with the walls of the gorge in full view above the bend in the creek. After lunch, we packed back up and headed back whence we came. Now, the trail seems to go up hill slightly – even though it doesn’t look like it does – so between the incline in elevation, the several miles we’d already pedaled, and the belly full of lunch, some of us had to take the return trip a little slowly. Made a quick stop back at the Turkey Path trail, parked the bikes and climbed up some of the wooden stairs overlooking the waterfalls. It was nice to step out of the sun and into the cool of the woods and the falls for a few minutes – but the trail itself is a bit of a climb. Most of the trail guides give this one a more advanced rating, because it’s a steep climb up the gorge. Returned to the trail, retrieved the bikes and pedaled the last mile or so back to Darling Run. Someday it’d be good to come back and take on another stretch of the trail, maybe farther up at Ansonia, or maybe the southern stretch of the trail near Jersey Shore. But the Darling Run-Tiadaghton section was definitely a great introduction to Pine Creek.